Note: More to Life with Faith and Lois is designed to be heard, not read. We hope you’ll listen to the audio, which includes emotion and emphasis that won’t be on this page. Our transcripts are generated with speech recognition software and may contain errors. Welcome to the podcast, More to Life with Faith and Lois. Our podcast explores life’s many transitions that inspire and daunt us. Good Morning Lois, How are you today? Oh, I am just so glad to be together. Working through transitions with you makes it all better. We are transitioning, aren’t we? We really are. We really are. You know, our decision to hit this year running basically with this theme of transition is a really beautiful way for me to keep breathing, to remind myself that some of these things that are heavier or lighter are all going to come through. They’re all part of movement. They will change and pass and they are transitions and I have to accept them for what they are. We face transitions continually. We just aren’t always aware of it, but when you wake up in the morning, you’ve just transitioned from the day before from the night’s sleep and you’ve transitioned into a brand new day and so we moved through the transitions throughout the day of everything that is expected and unexpected and we’re good at it and we need to give some credit to ourselves that we really are good at transitions. We just need to honor that when some of the unexpected transitions happen. Because transitions take all sorts of shapes. Some are in a moment, some are a few hours, some are a season, and then some are unexpected and some are really painfully unexpected. So we are going to deal with all sorts of transitions in life that ebb and flow, some of which we kind of deal with on a lighter basis because we just do like last week when we move in with people, that’s usually something that we’re more buoyant and excited about and this week we’re going to deal with something a little more difficult because transitions, like we say, look different every time. So today we’re on Episode 56. Transition: The impact of injury or illness. And this most often, is the unexpected? Yes, and they hit us hard. They surprise us we don’t feel good. We now have a flood of emotion that comes up. Sometimes it’s fear. Sometimes we really don’t feel good and so we get depressed and down and feel immobilized, so there’s a lot of energy that comes up when there’s injury and illness of what am I going to do? How am I going to get through this? I just want to preface all of this with the fact that when the unexpected happens, and illness and injury is one of the biggest ones, it is an opportunity to take a deep breath and to say, who am I and how am I going to move through this? It’s an opportunity to see ourselves for more of who we are. We can be incredibly in a lot of pain, a lot of fear, a lot of hurt, not feeling good, but we always have the choice to say, how am I going to do this? And if we just, will take that moment to say, how am I going to do this? What do I need and how am I going to take the steps through this time? We’re going to come out the better for it. Yes, yes, and injury or illness may be something that you’re facing right now. It also could be something that someone very close to you is facing, so as a result you are part of that injury or illness, so never underestimate what happens when you are the right hand person or a deep loved one for someone who is facing this because it’s part of your life now and how you present and deal and cope is also going to impact how they make it through their illness. It’s not on you by the way, but it is on you for how you are going to make it through and how you can be the most helpful or the biggest blessing to the person who you were with. These are a lot of moving parts here, but injury or illness or something that we all face on some level at some point in our lives. Hopefully it’s not all the time, unless of course you’re facing some sort of chronic illness where you are having to adapt and change up your life so that you can function in a way that you want – to the best of your ability and the way that makes you feel the best and those are all tools that you will learn through your life, but we’re here to encourage you in this moment where we know it’s difficult because this transition in particular is one that can take a great deal out of you. And you made a really good point about the caregiver and or if there’s a family member, children, other people in the home, even if you have a pet, the pets will react to your injury and illness, all of this you need to take into account that that huge transition of an event that has happened to someone is going to spread and have a ripple effect throughout everyone around you. We talk a lot about our attitude and how we face things. So the last thing we want you to think as we are approaching this episode 56, transition. The impact of injury or illness is that we would say just be positive and it will all be okay because if you’re in pain right now, that’s probably something you absolutely don’t want to hear because you know you don’t feel good. At some point you might feel better and might be more receptive to those kinds of words. So we want to give you the space to feel the pain that you’re in, to acknowledge a diagnosis that you’ve received that is really real. And then to decide how you’re going to move through it. These are all steps and sometimes we jump way too fast to try to encourage somebody by you know, this chin up kind of thing and we can really hurt people. And by the way, I’m sure I’ve done that to some of you that know me well and I, I really apologize because I think my attitude has always been, come on, let’s go for this. And, and then you get in this really difficult situation where somebody will say, you know, Lois, I just need some space. I get to be sad for a while, and you do. And I do and we all do. Absolutely. I mean how we move through something, it’s not necessarily how someone else was going to move through it and we forget. And this is so true, the pain tolerance levels that people have and some people have really, really high pain tolerance. They can endure all kinds of things. You talk to me, mine is almost a zero. I mean if I stub my toe, I just like, I feel like I could almost pass out. That’s how much pain I feel. So you can’t take someone else’s point of view and take it on as yours. It’s just not possible because we are made different, our nervous systems are different and what we react to and respond to is so unique and we need to honor the uniqueness of what that person is going through. So how do you manage injury or illness for yourself or someone you care about? That’s what we’re going to explore today in this 56th episode. One of the things is to acknowledge just how hard the situation is. We’ve just been referring to this, but no matter what’s going on, whether it’s a diagnosis or it’s a chronic situation or if you’re caring for somebody, allow yourself that room to say, this is really hard. This really hurts. I really need good attention. It’s okay, and I think in this day and age of trying to move through things so quickly and let’s get through this. We don’t always have the luxury when we are ill or if we’re injured in a car accident to do that, we may not be able to do this quickly and our recovery may take much longer than we anticipate, so acknowledge that and own that for yourself because that changes a lot of the way people respond to you. If you take that space to know that this is going to be awhile and you communicate that the response is quite different. That’s not a woe is me, poor me. It’s this is what I’ve got and it’s going to take me awhile folks, so please give me the room. To be empathetic and to be sympathetic is not to just enable somebody and sometimes I think people take that word wrong. I’m enabling you to be in a certain place. Now. What we want to do is to be able to care enough to ask a good question. I have a very good friend who always says ask a good question and if it isn’t a good response, ask a better question and I’ve learned to do that a lot. So things like what would be helpful? Update me. How are you doing right now? If someone’s in pain asking the question that they do in the hospital between one and 10, what’s the pain level so that you’re aware of what that person is going through rather than trying to fix it and change it. It’s more important to understand it. And you’ve brought up something that’s so powerful and for all of us who have different thresholds, pain would faith mentioned when she says if she stubs her toe, it’s extremely painful and for someone else that might be something you just like move, move through. We can’t judge how someone else is going to feel. So if we’re asking them on a scale of one to 10 and that person says this is a nine, and we’re like, okay, we have to accept that. We don’t get to choose to say well no, I don’t think that’s a nine. I think that’s a two and I think that’s what we do sometimes when we’re judging people and what they’re going through. So this is a big piece of how to deal with injury or illness and transition and that is to acknowledge what someone says they are feeling. Right. Period.n. I remember the time I sprained my ankle and I was in such excruciating pain that I really truly thought I broke it. I mean it was so painful when I went in and the nurse was there and I had tears pouring down and she had the audacity to say to me, it’s not that bad. Oh, I wanted to throw something because she did not take into account that pain level tolerance. I really was suffering and she was ignoring it. Like you just sprained it. What’s the problem?. Well, that is a big piece when you’re transitioning with someone or if you have that, acknowledge it and accept what the other person says is their level of pain that they’re going through. You know, the next thing is really to create some kind of plan, learn as much as you can about your chronic illness or whatever injury you have or whoever’s working alongside of you and keep really good records so that every time you see a physician or you see your acupuncturist, whoever you’re seeing that’s helping you deal with this malady, that they know what you’ve done before and what is coming up. This sounds so simple, but I can honestly tell you, having lived with both of my parents who became very ill, some records I kept better than others and the more I had on the ready and was able to present and explain with physicians, the better my parents care was because I was their caregiver. I was the spokesperson. So I learned through those years to keep records of that so that when I was in the presence of a physician, there were no surprises. And I encourage you to do that as hard as it is and whatever pain you might be in to start, if you can. It doesn’t have to be a journal every day, but whatever notes you have from physicians, keep those handy so that you’re referring to them and not only your pain, not only what’s going on, but what has been diagnosed for you. And word of caution. We are so quick to google everything and to pull up everything that’s ever been written on what you’re going through and some of that is good, but you need to be very discerning because there’s a lot of things out there that can generate more fear and confusion. Always go to your doctor and find and if you need a second opinion or a third opinion, get it, but get it from the professionals so that you can hear, Are they in unison? Is there a common factor going on here rather than you’re getting. I don’t think it’s this. My doctor says it’s this but, but Google says it’s this and that can leave you in a kind of a tizzy and add more confusion to the situation as you moving through your healing. And if it’s possible. If you can find someone who will join you in this process, whether they go with you to the doctor’s office or you check in with them afterward, especially if you’ve had a major injury or you’re going through a very trying illness, doing it all by yourself is very difficult. So as you’re creating this plan and keeping records and presenting those to the physicians, have someone that you regularly share this with who won’t overdramatize or under dramatize what you’re going through, who will just listen and be there with you so you don’t have to do this alone and make sure if there’s recovery that needs to be done, that you have the support that you need so that you can get that. And then focus on what you can control. Sometimes as you’re looking at the impact of injury or illness, we forget that there are certain things that we can actually do that will give us our power back. Some of it might be diet, changing things up that we know will make us feel better for whatever we’re dealing with and it gives us that sense of control back. Even if we can’t prepare it for ourselves, but we know what we need to eat. We can ask somebody to get it for us. I mean little things like that I’ve found for me have been enormously helpful because what really happens with injury or illness is that we’re losing control, right, and we don’t like that it and were in pain, right? There’s a lot of things going on that we really don’t like, so if there is some measure of control, you can take back. A lot of it can be in following the regimen that your physician or somebody gives you so that you can begin the healing process. And if you begin to find yourself being a little snarkier or reactive and kind of even mean at times that means you really feel out of control and you’re trying to regain some control. Those are some symptoms, some external symptoms to catch yourself and to say, okay, what am I needing and how can I do this? Talk about the fact that I feel like I’m losing control. Talk to someone and say, I just feel trapped. I don’t feel like I have my life right now and that’s scary to me. If you can put it into words, you’re going to quiet down and then you can bring it back into balance of what you can do and get the help for what you can’t do yet. And you mentioned just a few moments ago about going on the Internet. I know we all do this. You know, somebody says to me, Oh my sister has this. I’m looking it up right away. When you are in that predicament and have had this injury, one of the best things you can do is ask your physician for places to go to research so then they might be able to say, look, this is a really good thesis to read on what you have and how it’s being treated so you’re not just throwing it out to the wind and picking anybody out of the blue who may not be able to address your exact symptoms. So that’s another way to get more information because I think when we feel out of control, we also feel like, well, what’s really happening is somebody not telling me something and there’s good reason to feel that way by the way, really good reason. So if there’s more information you can get, even if it’s information that’s hard to read about what you’re going through, at least you have more to balance out what’s really happening in your life. Yes, that’s excellent. Is to get good information, good resources, good direction from those who are already the experts in that field. And then expect to feel overwhelmed. I shouldn’t be laughing, but I mean the truth is we can do all of these things and we can get a good regimen and we can be researching and then we’re overwhelmed because our bodies are changing right before our eyes or we can’t do something we were always able to do and we’ve been told you will not be able to do a certain thing again and that is overwhelming Faith. It just. It’s hard to accept that news. It’s huge. The transition of moving from how you did your life yesterday to how you are now doing your life today and tomorrow and maybe for a season and maybe even for the rest of your life, depending on what’s happened, is a huge monumental thing to take in and you need time to adapt to that to be able to move into acceptance. Yeah, it is good to move into acceptance sooner than later or you’re going to suffer longer emotionally, but you do need the time to do that and you need the help to do that. So depending on what you are facing, depending on what is going on, weigh that and be clear, I really need help with what is it and then let’s get the people to help you to get that. And this is just so critical. If you are caring for somebody or with somebody who has been given a diagnosis that is going to change their lives dramatically. Maybe you’ve had an emotional situation in the last year or two that has taken you for a loop. If you can think back to how long it took for you to get to that place of equilibrium to say, Oh wow, I’m really learning something from this. I’m speaking from a very personal experience that it’s taken me 22 months right now to get from a very difficult situation to finally say, well, I can see the blessing in this. So folks, that’s almost two years. If I had been given a diagnosis at that same time and in three months somebody would have said, well, look at all the bright things that are coming to you as a result of this. I was not ready to even acknowledged until 22 months that this painful situation is producing this fruit because it took that long for me to grieve and make it through. If you were having a life changing situation with an illness or injury, it might take you that long. It might take you longer. That’s okay. And all of us around have to be supportive of that and it’s really hard for us and I’d get that for all of us, but think of how long it takes you to get through what you get through and make sure as you watch your loved one going through that we’re not trying to push someone because we don’t want the pain that they’re experiencing to keep coming on us and that’s our job by the way, to figure out how to love someone and stand in our own strength and not take on their pain. But sometimes we don’t do that well, so we just want them to be well so we don’t have to think about it anymore. Right. And we’re talking then about ourselves rather than about caring about what they’re experiencing. People who face chronic pain, I have clients who have chronic pain and I have my sister has chronic pain and I just see them as courageous warriors to face it day after day and still to push through to do a job, to do what they need to do, and then they have to collapse at the end of the day to kind of take care of themselves and kind of get restored and renewed. They just are so courageous to face it and to do it, especially when I’m with my pain tolerance being as low as it is. I don’t know how they do it. I admire them, I respect them and that’s what I tell them. I tell them, you are so courageous and I’m so proud of you that you don’t give up. You keep trying to find that next step, who might have the next best answer for you and they don’t. They don’t stop. That takes courage when you speak into that, that’s uplifting them because you can’t change their pain. You can’t make it go away, and I think that’s the powerlessness that caregivers oftentimes feel. They want to see it change because they see suffering and they don’t like it, but if you can encourage that person, you’ve come a long way in helping them move into the next step. We know this is a difficult episode. Transition, the impact of injury or illness. One way to really manage this kind of situation is to find ways to take care of yourself. How can you do that? Does it mean being able to take a walk, If you’re physically able to do that? Does it mean sitting in a place where you can observe birds? I don’t know what it would mean for you to feel that peace – reading or listening to something that’s really beautiful or watching something that makes you smile, but find ways to take care of yourself. We don’t have to just give up on taking care of ourselves and being gentle with ourselves because we’re ill.
And that is knowing yourself. What is it that you need and if you’re really the one who is suffering and you’re hurting and you’re ill, don’t be so stoic that you never ask for help or for what it is that you need because if you do that, you’re going to help not only yourself, you’re going to help the person that’s there with you. So ask for what you need and if it is a change of scenery or you need something different to eat, something that can bring you some pleasure. My husband is fabulous at reflexology and so the foot rubs make a huge difference. If I have a headache, he can take it away in 10 minutes and I ask for it because it’s like there’s help there for things when I’m not feeling well. When I had surgery, the very first thing he did was to give me a foot rub and it began to help the healing process within me, so I know that that helps me and that is something he can do for me and loves doing that. So don’t deny yourself of what can be helpful. Ask. for it. And that is so hard for so many to really ask because that puts them us in a position of needing you, of wanting something and so be free, and that’s one really amazing way to be kind to yourself, to be gentle to yourself, to ask for that. That’s beautiful Faith because I really mean it. There are so many people who are reluctant because it shows more weakness on top of an illness. That’s how I’ve heard from people who are reluctant to do that. I’m already sick. I already am such a burden in this arena that if I ask for something more, maybe you’ll go away. That isn’t the case with the people we love and so, that is a great, great gift that you can actually give the person who’s helping you because then we know how to respond, right? Because sometimes we don’t know and we’ll do the wrong thing. I know it works so much better if you’re doing something that really does help and if you’re the caregiver. Likewise, you need to take care of yourself and find what are the things that I need to do and that’s having someone else come in and take over for you for a while so you can go to a movie. You can go out to dinner, you can do something, you have a day off, whatever it is that you need. It’s on both sides. It’s not just being so stoic. I have to be here 100 percent of the time or I have to be strong enough to not tell you how badly I’m feeling. No. This is about a cooperative journey that the two of you are doing together and it can work best if you get your needs met. So sometime in your life. If you’re not experiencing it right now, you will be transitioning through an illness or an injury and it definitely can be daunting, but the more you work through what’s happening to you, maybe with a close group of people or even one person who can support you, the better you’re going to be able to cope with all of the changes that are coming your way and hopefully transition to this process with – if not full healing, a peaceful feeling about what’s going on in your life. So if you’re facing the impact of an injury or illness, we hope some of these ideas will help you cope with your new situation. You don’t have to face this alone. Maybe you know someone who’s in this situation. We would love it if you would pass along this podcast and follow us on our social media platforms for all of the transitions we’re now sharing with you next week. Transition the impact of new life in the family. Get the latest news on our social media platforms and on our website and please subscribe more. 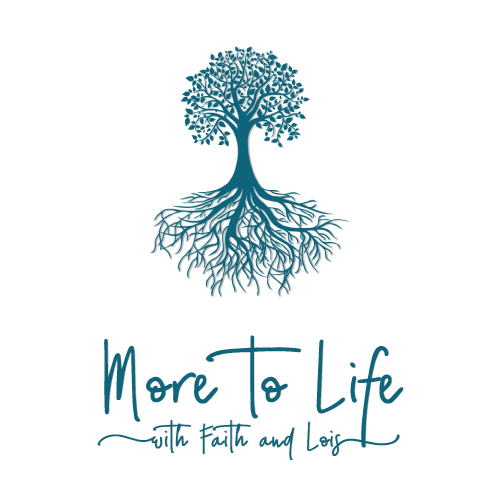 More to Life with Faith and Lois is a podcast to support, encourage and uplift you. As you transition through all sorts of change. We want you to know there is more to life. More Live with Faith and Lois is a podcast to support, encourage and uplift you. As you transition through all sorts of change, we want you to know there is more to life.